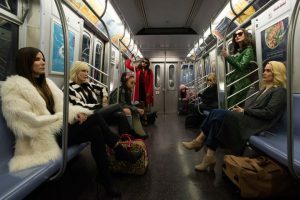 The latest installment to what was thought to be a trilogy, “Ocean’s 8” follows an all-female gang attempting the heist of the century. In the released photo, we are teased with an on-location photoshoot of the movie’s stellar cast led by Sandra Bullock and Cate Blanchett. Set to be released on June 8th 2018, the Box Office aspirant stars Anne Hathaway, Helena Bonham Carter, Rihanna, Mindy Kaling, Awkwafina, and Sarah Paulson. Also said to appear is Matt Damon, as one of the characters of the first movies in the franchise.